The Flamin' Hot taste was first introduced to consumers in 1991 with the Cheetos brand by Frito-Lay's research and development division. It was meant to provide a slow burn of red peppers followed by a sensation to either want more or run for water. Either way, people wouldn't want to wussy out, so they would want more. They were also developed as the perfect addictive snack for any social occasion. But, be careful, be prepared to have fingers that look like "E.T.". 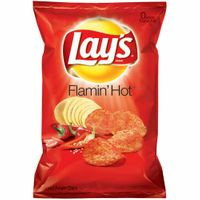 Right about the same time frame in 1991 Frito-Lay also introduced the Lay's Potato Chips also with the flamin hot flavor. Fritos Corn Chips came only until 1999 and finally MUNCHIES Flamin' HOT Snack Mix in 2003. What will be the next Flamin Hot flavored snack?